IF the makers of Mune are to be believed, drinking a bottle of their new flavoured spring water could transform your life. Marketed as “100 per cent natural immune support”, Mune contains an impressive list of vitamins hand picked to support and enhance the immune system. Putting its health benefits to one side, we decided to focus on Mune’s taste. The flavours we received were Original and Revive, but the names belie a staggering list of ingredients. Original, for example, combines tart cherry with black elderberry, lemon, manuka honey and ginger, while the Revive bottle contained coconut, pineapple, blood orange, lemongrass and nettle. What is certainly true for both versions is that each individual ingredient stands out. Mune Original’s initial taste is definitely mainly of cherry, but the honey and ginger linger longer on the palate. It’s a distinctive flavour that certainly won’t be to everyone’s liking, but it’s definitely different to anything else on the market. We preferred the fresher flavour of Mune Revive, which was reminiscent of a pina colada and left us feeling refreshed and hydrated. The sheer number of goodies packed into each bottle might suggest the overall tastes would be a bit of a confused muddle, but the combinations work surprisingly well. While we are not scientifically knowledgable enough to comment on the efficiency of Mune’s immune system-boosting Wellmune WGP beta glucans, the absence of any added sugar or artificial sweeteners is definitely a plus point. It is also comforting to know that each 330ml bottle provides 50 per cent of the recommended daily allowance of vitamins B3, B5, B6, B9, B12, C, D3 and zinc. And with no gluten, wheat, lactose, caffeine or preservatives, it is also suitable for people following a range of diets. Costing £1.79 per bottle, Mune is not the cheapest bottle of water you will ever buy but it is certainly enjoyable and refreshing. 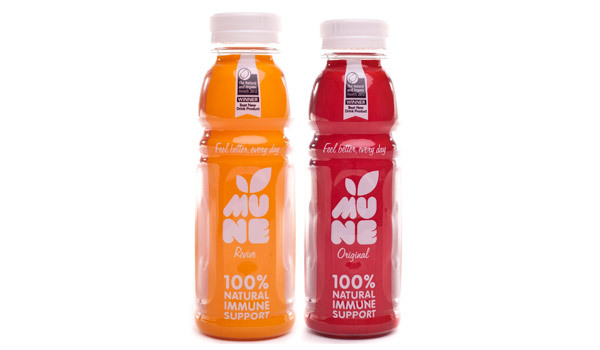 Mune Immune Support is available from leading independent health stores nationwide, Holland & Barrett Whole Foods Market, Nutri Centre and online at www.munehealth.co.uk.